Several days ago I posted a comparison about using different sealants in these inset tray rings. Today I’m sharing a tutorial on how I made that fun ring! It can be made with all sorts of color combos of course. This gold edge reminds me of an antique look. The ring trays I have are about 2mm deep. The paper I used is 3mm (1/8″) so it sticks up above the edge of the tray just a little bit, but that is totally okay and it works fine. Roll all of your strips of paper with the slotted quilling tool and glue shut while they are still tight. Below in the first photo you can see the ring stuck into the styrofoam, and all of the tight rolls ready to go in. Use your sealant (here I was using Diamond Glaze ) to fill in a light layer around the whole bottom of the tray base. Use your tweezers to pick up and place the pieces into the tray as shown. Of course you can experiment and put them in any order you think looks nice. If you place them differently you may find that they don’t quite all fit, or maybe you have extra space. If that is the case, make more pieces to fit just the way you want it to. You might even find that although you make the exact pieces I describe that they don’t fit exactly how mine are fitting. It may be due to the size of your quilling tool, how tightly you wrap the rolls, etc. But don’t worry, just play around with them, make more if necessary, and you’ll get it to look great! Once all the pieces are in place (middle photo below), you can start covering the entire tray with your sealant of choice (shown in third photo). Once you have sqeezed enough sealant over the design, you can use a toothpick or needle tool to make sure it is covering the sides of the pieces if they are sticking up at all, and also to pop any bubbles. If you are finding it difficult to pop the bubbles it can help to wait a couple minutes so they come more fully to the surface. Use a needle, pin, etc. to pop them. You can also use the needle/pin to drag the bubble towards the edge which makes it easier to pop as well. Once all the bubbles are popped, let it dry for several hours. Your fun fashion ring is now ready to wear, gift, or sell! Having fun experimenting with all sorts of color combos, metallic paints, etc. to add flair and fun. 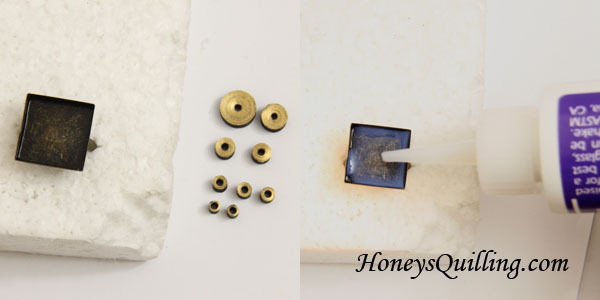 Have you used ring or pendant trays to display your quilling for jewelry? How do you like it compared to simply adding hooks to your quilling to hang it? I love the durability of using pendant and ring trays, but it also has some design limitations.